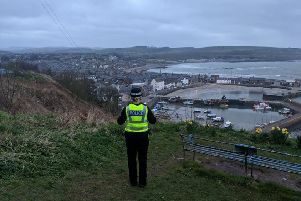 Police officers stopped hundreds of cars on last week on the A90 from Fraserburgh to Edinburgh in a series of coordinated patrols and checks. Over 600 vehicles were stooped on 176 mile stretch of road between Monday April 11 and Friday April 15. During the stops 185 drivers were found to be speeding while five were recorded at over 100 miles per hour. Eleven vehicles were also seized by Police after being used without insurance or by drivers who were either disqualified, had no licence or driving outwith the conditions of their licence. Seventeen drivers were also reported for using mobile phones while driving. Sergeant Steve Manson from the Trunk Road Policing Group, who led the operation, said: “We have carried out a number of operations to reduce road casualties and influence driver and road user behaviour, as well as detecting and deterring criminality on our roads. “As part of a National Police Service, Road Policing units are able to easily work together to target specific areas or roads without being restricted by previous Force boundaries.